This week: flaming cocktails and secret bars. Here’s your plan. You’re going downtown. Let’s step up your sartorial game a bit, eh? 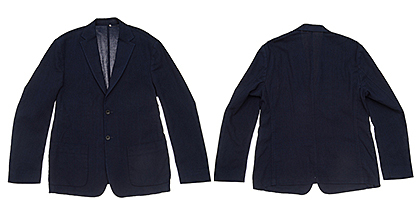 The Levi’s Made & Crafted Blazer is stitched from Japanese waffle cotton and dyed in indigo for a comfy fit and a classic look. Rock with a spiffy tee or fitted button-down. Faith & Flower is where you go when dining with a group. They’ve got inviting banquettes in which you can share plates of silky rich oxtail agnolotti and earthy mushroom quail. Most drinks seem to be served ablaze, and the tableside absinthe is prepared in a way that lets you take vapor hits that go straight to your dome. Bottoms up. Bar Jackalope, a new 18-seat, Japanese-style whisky bar, is hidden in a back room at Seven Grand and will keep you feeling peachy with premium pours like Four Roses Limited Edition. Ring the doorbell on the first door to your right past the bar. If they’re full, they’ll take your number and you can wait at the front bar for them to let you in. It’s worth the wait.